The Bernabéu lived another successful Champions League night, as Real Madrid hosted and beat Napoli 3-1 with goals from Benzema, Toni Kroos and Casemiro. The return leg will be played in Italy in 3-weeks time. It was a magical night in the Bernabéu, as Madrid took a commanding 3-1 lead in the first leg of their UEFA Champions League knockout match against Italian side Napoli, putting to rest any doubts about their ability to perform on the biggest stage this season. 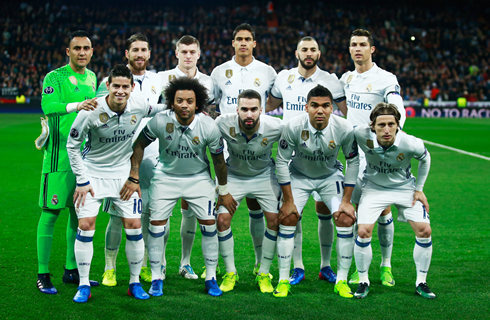 Goals were delivered by Karim Benzema, Toni Kroos and Casemiro. It was a scintillating performance, one worthy of the Champions League, as Los Merengues took the match to Napoli from the opening minute and were able to recover from an early setback. Cristiano Ronaldo may have not written his name in the scoresheet, but he sure had a big and positive impact in his team's offense tonight. But Real Madrid would waste no time getting back into the match though and Karim Benzema, who has been struggling as of late, headed in the equalizer in the 18th minute from a brilliant Dani Carvajal cross with the outside of his boot. Madrid continued to press as Cristiano Ronaldo became the focal point of the attack. Ronaldo was quite lively down the wing, dribbling well and causing havoc in the final third. His brilliant low cross to Benzema was clattered off the post by the french forward midway through the first, as it became clear that Madrid were hungry for blood. Soon after, Madrid had saved the best for last from an unlikely source. Pouncing on a clearance from the box, Casemiro, of all people, hit a perfect one-time volley into the corner of the net. Possibly the best goal of the season thus far and the best in the Brazilians' career. It was the perfect way to cap a great night for Madrid. 3-1 isn't an insurmountable lead, however, Madrid will be full of confidence heading into the San Paolo in three weeks time. Cristiano Ronaldo next game is a La Liga fixture, on February 18 of 2017 against Espanyol. You can watch Juventus live stream, Real Madrid vs Espanyol, Villarreal vs AS Roma, Manchester United vs Saint Etienne, Gent vs Arsenal, and Benfica vs Borussia Dortmund, all matches provided from our live soccer game pages.